The American literary figure Sylvia Plath was a poet in addition to being an accomplished novelist and short story writer. She was born in Boston, Massachusetts on October 27, 1932. Her father, Otto Plath was a university professor and her mother was also an educated woman. In 1936, after the birth of Sylvia’s brother, Warren, the family moved to Winthrop, Massachusetts. A promising child, Sylvia showed talents in writing and drawing since a young age. She published her first poem at the age of eight in the children’s section of Boston Herald. In 1947 she won The Scholastic Art & Writing Award for her paintings. When Otto Plath died shortly after her eighth birthday, Sylvia suffered feelings of both anguish and freedom. Otto was a strict father with an authoritarian attitude towards his children. Sylvia’s defined the relationship with Otto in her poem, Daddy. After the death of their father, Sylvia’s mother moved her children to Wellesley, Massachusetts where Sylvia graduated from Bradford Senior High School in 1950. In the same year, Plath entered Smith College where she excelled academically and also became the editor of The Smith Review and was also offered a prestigious position as a guest editor of Mademoiselle Magazine in the summer of her third year at Smith for which she spent a month in New York. Here on began the psychological problems of depression which eventually took Plath’s life. 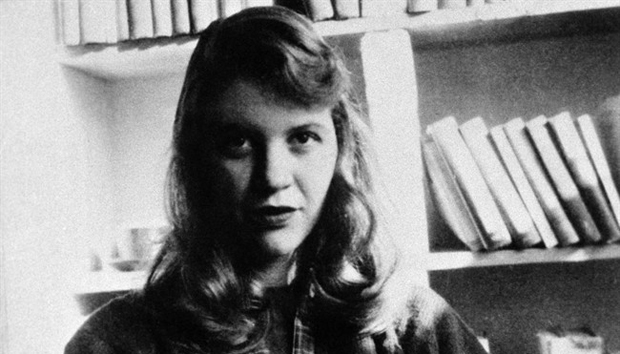 Many events that took place during that summer became inspiration for her novel, The Bell Jar. After undergoing electroconvulsive therapy for depression, In August 1953, Sylvia Plath made a first medically documented attempt to commit suicide. She took her mother’s sleeping pills and crawled under her house where she remained for three days. Sylvia was sent in psychiatric care for six months where she was given an electric and insulin shock treatment. Making a good recovery, Sylvia returned to college and graduated with the highest honors after submitting her thesis. She was awarded a Fulbright scholarship to Newnham College, Cambridge where she continued to write poetry and publish her work. At Cambridge, Sylvia met the poet Ted Hughes. On June 16, 1956 the two poets married at St George the Martyr Holborn in the London Borough of Camden. A few months later the couple moved to the United States where Plath taught at Smith College. In 1958, they moved to Boston where Plath worked as a receptionist at Massachusetts General Hospital and took creative writing seminars given by poet Robert Lowell who encouraged her to focus on becoming a serious poet and short story writer. Sylvia enjoyed writing deeply personal and private thoughts. In 1959, the couple moved to London where their daughter, Frieda was born. Sylvia published her first collection of poetry, The Colossus in 1960. She also completed The Bell Jar in 1960 followed by the birth of her son, Nicholas. In 1961, Sylvia had a car accident which she later admitted to actually being a suicide attempt. In September 1962, Plath and Hughes separated after Plath found out about Hughes’s extramarital affair. Following the separation, Plath wrote some of her most famous poems which came together to form the book, Ariel. The Bell Jar was published in 1963. On February 11, 1963 Plath committed suicide using her gas oven. Her posthumously published collection of poems, The Collected Poems won Plath the Pulitzer Prize making her the first poet to win the prize after death.